A Himalayan train ride at more than 100 kilometers per hour at the foot of the world's highest snow-capped mountains and oldest glaciers is no longer just a dream, Chinese railway experts say. With more than 19,000 km of high-speed — up to 350 km per hour — railways, China has accumulated the technology and experience to build a rail link between the Tibet antonymous region and the South Asian subcontinent, they say. 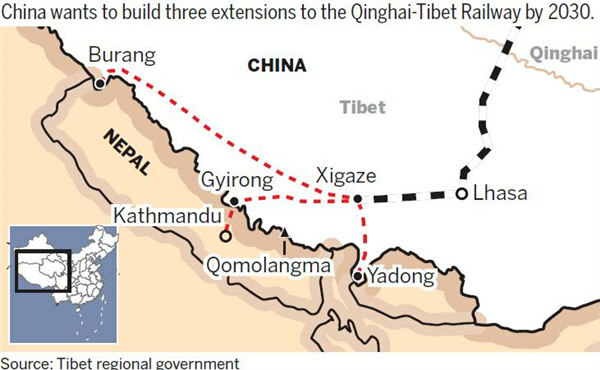 The Himalayan railway would start from Xigaze, a city in Tibet, run to Gyirong, a land port on the Chinese border, and extend into Nepal, although it would not be a high-speed railway, the researchers said on Thursday at a forum in Beijing run by the China Tibetology Research Center, a Tibetan studies organization. In 2006, China built a railway running for more than 1,100 km to connect the highland region of Tibet with the rest of the country. In 2014, it built a 250-km rail link between Lhasa, the Tibet regional capital, and Xigaze, the region's second-largest city. Trains run at 100 km per hour throughout the Tibetan rail system, which according to China's railway plan for 2016 to 2020, will stretch from Xigaze to Gyirong. Nepal hopes that China can connect this port with Kathmandu, the Nepalese capital, as part of the China-Nepal international railway. China hopes the rail link will boost economic, cultural and religious communication with Nepal as part of the Belt and Road Initiative proposed by President Xi Jinping. "The construction of a railway crossing the Himalayan mountains is now economically and technologically feasible," said Zong Gang, deputy director of the Science and Technology Department at Beijing University of Technology. The altitude at Gyirong port is 2,800 meters above sea level, while the Gyirong mountain pass to Nepal lies at about 1,800 meters, making the railway geographically feasible. In contrast, Lhasa is about 3,700 meters above sea level and the altitude at Xigaze is about 3,800 meters. Losang Jamcan, chairman of the Tibet autonomous region government, said on July 1 that building rail links is the most powerful way to help Tibet open up to South Asian countries. After a meeting between Premier Li Keqiang and Nepalese Prime Minister K. P. Sharma Oli in March, the two countries said their governments will further discuss construction of a cross-border railway and also support companies conducting preliminary research. At least two Chinese companies have shown an interest in developing rail networks connecting China with Nepal, the Kathmandu Post reported on July 2. China CAMC Engineering Co has proposed building a 121-km railway linking Kathmandu and Rasuwagadhi, a land port in Nepal facing Gyirong. China Railway Construction Corp has applied to the Railway Department in Nepal for a Kathmandu-Rasuwagadhi railway feasibility study. Ma Jiali, a researcher at the China Institutes of Contemporary International Relations, said a trans-Himalayan railway would be of great economic value as it could later connect China, the largest economy in Asia, with India, the continent's third-largest economy. He said that landlocked Nepal is willing to have a more convenient link to China because it believes that China's development will offer great opportunities for Nepal. Zhou Yuhui, a professor at Beijing Jiaotong University who has just returned from a field visit to the China-Nepal border, said, "There are rich tourism resources, including virgin forest, canyons and historical relics in Gyirong, which has hardly been developed. "While bringing tourists and businesses to Gyirong, which will help local people to escape poverty, the China-Nepal railway will also help ... to make people more willing to integrate into modern life."